Yours is a multisite hospital system or a large radiology group with a growing network of referring physicians. You would like to grow your business amid intense competition. How can your new picture archive and communications system (PACS) help make a difference?Which vendor offers the fairest contract terms and will support you over the long haul? Whose implementation is the smoothest? Yet in the era of anytime, anywhere health care, when speed and efficient delivery of service are paramount, what should today’s PACSlook like? To answer that question, first envision a PACS ecosystem that extends well beyond radiology. Next, search for a PACS that helps improve productivity through useful features and functionality, accessibility, and scalability. Consider compatibility with existing IT solutions, in particular with electronic health records (EHR). Then devise a data migration plan and test integration. Finally, measure productivity to determine your return-on-investment (ROI). If the goal of implementing a new PACS is to enhance productivity and grow your business, then functionality is mission critical. Replacing a PACS presents the opportunity to rethink your entire imaging strategy and identify the features and functionality that will enhance workflow and productivity as well as services to referring physicians. “The top priority—you want to get a PACS that your radiologists are going to like using,” said Gary Danton, Chief of Imaging Informatics for the Department of Radiology, University of Miami (Miami, FL). When the University of Miami acquired its namesake hospital and integrated it with the remainder of the UHealth system, a single PACS was needed for the large multisite hospital network. Radiologists wanted an easy-to-use and complete platform to drive their specific workflow. Many of the hospitals in the network were already using Philips iSite PACS. “We wanted a PACS that could facilitate our workflow. We are integrating all sections of radiology, and we needed to divide the studies into worklists based on who was going to be reading what kind of study,” Dr. Danton explained. The radiologists also looked for a solution with workflow tools to facilitate daily work, including peer review, critical findings, communication between radiologists, and a single log-on enterprise solution. “The new PACS has streamlined the daily workflow, and because the PACS is now unified, when you go through the different facilities,you are looking at the same dataset, making the process more efficient and consistent,” said Russell Kuker, MD, Diagnostic Radiologist,University of Miami. Another important feature was the ability to view images on mobile devices. “Now radiologists want to be able to review a study remotely. If a radiologist is on call, he or she can do a preliminary read on an iPad,” Dr. Danton noted. Efficient communication with referring physicians is an integral part of the competitive strategy at Vanguard Medical Imaging, where they use Brit’s Roentgen Works system. “More doctors want to see reports on their mobile devices, and when we provide this, they remember that my practice was able to do that while others were not,” said Dr. Prakash. “I like Roentgen Works because after dictating a case with a microphone, you can call a phone number and relay the results to the physician. They have an urgent-callback system. The fact that it tells you there’s an urgent finding is great,” he added. Radiologists at Hill Medical (Glendora, CA) had their eyes on a PACS with several new features they thought would enhance report quality and productivity. According to Jon Foran, MD, a radiologist at Hill, some of the key features included a unified worklist to display images from multiple PACS on a single viewer, a system capable of prefetching images outside of the facility, and merging priors in a federated worklist in order to see relevant priors regardless of where they are generated. “We were looking for a PACS with critical-results automation, and peer review beyond 2% compliance with quality metrics; in other words, utilizing shared PACS text messaging capabilities. We wanted unsigned preliminaries to be immediately available to the EHR and eliminate hand-written prelims and faxes. We wanted to copy and paste exam data from the RIS. We needed to share folders for tumorboard, and, finally, we wanted advanced 3D on our PACS,” indicated Dr. Foran. 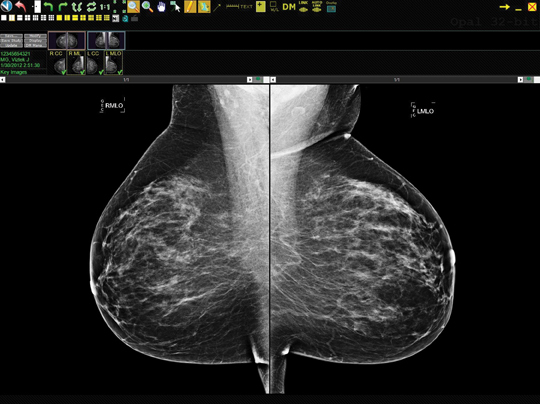 They adopted Merge PACS, which provides a fully integrated workstation with 3D, mammography, and PET/CT/MR/nuclear medicine fusion, that is web-based to enable access to images regardless of the referring physician’s physical location. The platform also offers long-term storage with iConnect Enterprise Archive integration. Today, providers need to determine how well a PACS works with their existing EHR. To support interoperability, consider implementing a vendor-agnostic content storage platform or an enterprise viewer to allow referring physicians to access images. Enterprise integration was of the utmost importance when the UHealth system unified its hospital network on Philips’ iSite PACS version3.6, and because it has plans to adopt Philips’ Intellispace PACS 4.4 next year. This means patients can undergo an imaging exam at any hospital in the health care system because all of the images are stored in one PACS. For referring physicians in consult with a patient, there is a single login to access all patient records and imaging exams. “The clinician should be able to open up a study directly from the EHR; ideally in a viewer that has all of the functionality that they would have as if they were in a PACS. That’s why you want a complete enterprise system, and you want it to integrate with your EHR,” said Dr.Danton. San Joaquin General Hospital (Stockton, CA) recently implemented Carestream’s Vue Motion, which links the PACS to the hospital EHR.The unified image viewer resides on a server that supports a variety of access methods to view PACS images as an HTML5 browser page. “We are moving into a period of competition, which means you not only need to meet your own needs but those of an external partner’s, or you’re not going to get those referrals,” indicated Don Johnston, CIO, San Joaquin General Hospital.“Right now, our concerns are on functionality and distributing those images, and we have chosen to look at EHR products that recall the image from the PACS; they don’t store the images. That was one of the attractions of Vue Motion—essentially it is EHR agnostic. We want to stick with an HTML5 presentation product that doesn’t require a dedicated viewer in order to get to the PACS,”said Johnston. According to the latest rules set by the EHR Incentive Program, commonly referred to as Meaningful Use (MU), images stored in a PACSor imaging archive will need to be accessible for viewing in an EHR environment. For Johnston’s team, integrating the image viewer to link the PACS with the hospital EHR was necessary for meeting the MU criteria.“Some of the latter stages of MU require exchanging meaningful information with other entities. Vue Motion allows us to tie into the privacy rules from the EHR so we are properly segmenting data that is based on the relationship a physician has to a patient. So this workflow will support some of the elements of stage 2 and 3 of MU,” he said. Security is another important consideration. With Vue Motion, the system enforces HIPAA patient privacy laws because, once the provider views a patient’s data, the client restricts the provider from accessing a set of images for another patient without having proper permissions. As Johnston explains, Vue Motion is called through the browser so that the EHR is enforcing the HIPAA compliance rules. Migrating data from legacy systems is an important milestone in the PACS replacement process. Specific challenges in database migration may include patient reconciliation, interfacing with existing IT systems, proprietary file formats, and the actual data migration itself. 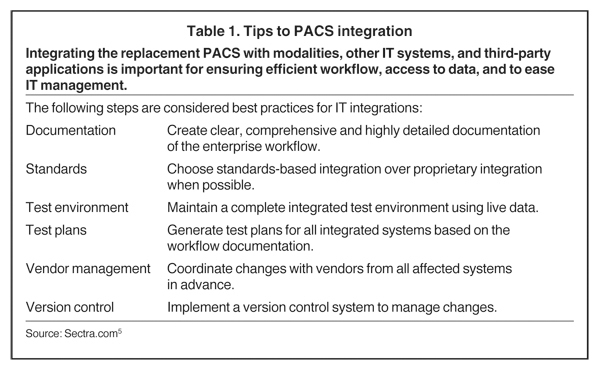 When integrating the PACS with existing IT, best practices for managing the process include: documenting the enterprise workflow in detail, using standards-based integration, running workflow tests in an integrated test environment, and working with vendors to make changes on all integrated systems (Table 1). Before getting started, however, it is a good idea to anticipate potential problems. Ask key questions, such as: Is there data from other hospitals? Is a RIS feeding the information? Is there old data and has it been through previous migrations? Which data needs to be migrated? Are all data types supported in the new system; eg, structured reports, word documents, PDF, RTF, and so on?5 At Hill Medical, the IT team hit a roadblock when it began migrating images and scanned documents. “Although the reports were already in our RIS, the scan docs were a bit of a headache to transfer. We found a third party that migrated the images and scanned docs in one operation – that was the most economical solution,” Dr. Foran indicated. Over the next 6 months, PACS administrators at Hill Medical expect to retire old and duplicate viewing workstations for hospital and outpatient PACS, comply with PQRS, and at the same time boost productivity and reduce costs. A common and costly problem is system downtime. With most PACS, there are bugs to work out in the initial integration phase, and thiscan cause burdensome and costly downtime. Yet there are several different strategies to ensuring total uptime. At The Doctors Clinic (Silverdale, WA), they decided to migrate data nightly. “We began migration at the time of go live. We migrate nightly and have completed about 90% in the 9 months we’ve been live,” said Brennan Dobbins, Clinical and Ancillary Services Director atThe Doctors Clinic (Silverdale, WA). The Clinic is part of Northwest ImageShare (NWImage), a collaboration of multiple imaging centers on a cloud-based regional imaging management platform, consisting of one data center and one image archive that they all share. “At implementation, we began a query and retrieve process at the scheduling and technician level for comparison to check if any patientstudies have not been migrated,” said Dobbins. “In the NWImage environment, Harrison Medical Center monitors the process and sends us reports on the number of studies moved. Then we clean up the mismatched RIS on our side of Sectra PACS.” This phased approach has proven very effective, says Dobbins. Another phased approach is one Philips Healthcare prescribes. Under their process, first, the image data is copied as it’s generated, then the data is archived in both an existing system and in the Philips iVault archive. The next step is to integrate iSite Enterprise to distribute images and reports from the radiology department to referring physicians sites. Once the current PACS contract expires, the department can move forward with adopting the iSite Radiology module, an open-platform, scalable radiology reading software, to complete the iSite PACS. There are several key factors to look at to determine whether a new PACS is worth the investment. These include the PACS solution’s uptime; ability to scale; interoperability; frequency, complexity and cost of upgrades; and the vendor’s approach to training and support. Some of these factors are measured over the lifetime of the PACS, while others, like efficiency, productivity, and cost savings, are more readily apparent. At Rays, gains in efficiency are monitored and factored into ROI. For example, the ratio of ‘sends’ per study actually reversed. The previous PACS required sending a study to 10 different locations, some of which were outside of their network. With the new system, customers send multiple studies to a single server in the data send, requiring just a single send to forward. Efficiency is not the only measure of ROI; increased productivity also correlates to ROI. Since The Doctors Clinic integrated Sectra PACS on the NWImage platform, it has seen tremendous improvement in productivity, patient care, and physician satisfaction, according to Dobbins. “Sectra’s superb worklist flexibility has streamlined our workflow for moving overflow studies to our outside contractor. Our referring physicians and radiologists are able to see all patient studies regardless of which local imaging center or hospital they we imaged in. This eliminates multiple sign on, passwords, and PACS software interfaces on physician desktops. We also have reduced our PACS and support costs by 60%,” said Dobbins. Cutting additional costs adds to the ROI tally. At Meadville Medical Center, they needed a more robust solution for backup and disaster recovery, but didn’t want to pay for more plug-ins. “With the previous PACS, there were several add ons, requiring additional licensing fees. It made more economic sense to upgrade the entire PACS rather than to add a second PACS backup and disaster recovery,” said Wilpula. Fortunately, backup and disaster recovery, a mammography and PET/CT interface, and a dictation and transcription solution came standard with Viztek’s Opal Rad PACS. “Now, we are utilizing the dictation and transcription system on the Viztek PACS—it saved us from investing in a whole new dictation and transcription system,” said Wilpula. As economic pressures place greater demands on radiologists to produce, the search for a game-changing PACS can seem overwhelming. It’s important to remember that replacing a PACS is an opportunity to develop a more effective and competitive image-management strategy. Construct a PACS ecosystem that extends well beyond radiology, accessible on the enterprise level and remotely. Look for a thin client or cloud-based solution that provides a robust toolset both natively or remotely; one that is mobile friendly; doesn’t require endless plug-ins; yet is scalable with minimal cost. Today’s PACS must be interoperable with EHRs, image viewers, image archives, and other IT applications. Devise a plan to mitigate downtime during data migration and software integration, possibly through a phased approach. Finally, before signing on the dotted line, or submitting a digital ‘signature,’ seek out a strategic partnership with a vendor who will support and respond to your needs during the lifetime of your replacement PACS. 2011 U.S. PACS Replacement Study. Capsite. http://capsite.com/news/press-releases/study-21-of-u-s-hospitals-plan-to-replace-their-radiology-pacs-solution/. Accessed July 17, 2013. Shrestha RB. Guide to replacement PACS, version 2012. Applied Radiology. 2012;4:36-37. About IHE. IHE. http://www.ihe.net/About/. Accessed July 17, 2013. Brown B. PACS 2011: A victim of its own success. KLAS. https://www.klasresearch.com/Store/ReportDetail.aspx?ProductID=694. Updated November 23, 2011. Accessed July18, 2013. RIS/PACS Replacement Best Practices. Sectra. http://www.sectra.com/medical/about/campaign/ris_pacs_replacement/. Accessed July 17, 2013. Technology Trends: Building a new PACS ecosystem. Appl Radiol. Cristen Bolan is the Executive Editor of Applied Radiology.